Nepal has enjoyed a fascinating political history, interspersed with tales of royal intrigue and power struggles amid rulers. A new addition to that list comes in the form of a dispute in the one-time kingdom of Mustang—a first for the region—a 20-year long saga that has just recently come to a jarring climax. The dispute began over a particular piece of property, namely the historic Lomangthang palace—the seat of the 24th King of Mustang, Jhigmi Palbar Bista, who at 79 years of age has just been handed the Supreme Court’s decision. As per the demands of Diki Dolkar, the widowed wife of the king’s elder brother, the verdict made official on February 16 2010, states that Lomangthang should be divided among family members, as it is ‘private property’. The court’s decision has presented several problems, the first of which is that the palace is en route to being enlisted among the UNESCO-identified world heritage sites next year. Built by the Amadpals in 1440 AD, the four-storied building is decorated with ancient wall paintings, and according to locals, is believed to be the site where various historically and culturally valuable artifacts went missing in the past and could still be found. The building is also located within the only walled-city in Nepal—comprising of 175 houses enclosed by 8.55 metre walls. Were the partition to proceed, officials at Department of Archaeology (DoA) say that UNESCO may rescind its decision. A second, and perhaps more pressing, issue is that Dolkar, who filed the case in 1992 with the complaint that she had been deprived of the family property, is shown to have already received her share on December 24, 1960. A document from 1982, verified by CNAS under Tribhuwan University, states that royal property including lands, utensils and jewellery had already been divided. Another significant concern here is that Diki Dolkar’s family, who accompanied her to Kathmandu, migrated to the US in the early 1990s after renouncing their Nepali citizenships. And it was learnt, during the reporting of this story, that while Dolkar has passed away, it is her daughters in the US who are holding on to the claims. The previous king of Mustang, Angun Tenzhing Dhandul Bista, had three sons, of whom Jhigmi, the current king, is the youngest. Since the eldest son (and Dolkar’s husband) Waangdi Ngimpo Bista died before he could be king, the position should have gone to his younger brother Aangdon Thukten Ghyacho Bista next. But Aangdon had already chosen a religious life, and so it was that Jhigmi was made king. According to locals, for many years, there were no noticeable rifts within the family, and they appeared very unified—that is until the time came to choose a successor to the present king, who has no son of his own. It was then that Dolkar began stirring up trouble. Had Dolkar a son, according to Mustang’s current prince, it would’ve been reasonable for her to demand that he be declared successor to Jhigmi. But since she only had daughters, she decided that her daughter’s son could be the lawful heir. In a kingdom that operated as per patriarchal principles, this was not acceptable, and King Jhigmi refused outright, preparing instead to announce Jhigmi Singmi Palbar Bista, who was his second brother’s son, as first in line. Reeling from rejection, Dolkar had then sold all her properties in Mustang and moved to Kathmandu with her daughters and grandchildren. But she hadn’t given up. Mustang’s prince tells us that by 1992, the king had still not officially declared a successor and knowing this, Dolkar came up with a plan that would coincide with her grandson’s wedding in Kathmandu. She offered to have King Jhigmi’s religious and official uniforms dry-cleaned before the function, and asked him to send them to her. Unsuspecting, the king did as he was requested, but once she got hold of the clothes, Dolkar had her grandson put them on and pose for a photograph. This photograph she sent to Narayanhiti palace for approval, writing to the erstwhile king Birendra, that formalities had been completed and that the boy in the photo was, in fact, the real successor to the kingdom of Mustang. But Narayanhiti would still need a nod from Jhigmi, who was made aware of Dolkar’s doings, and furious, he immediately declared Jhigmi Singmi Palbar Bista his successor. With her plans having failed, Dolkar then filed a case, demanding the partition of Lomangthang palace and other family properties. And although the king triumphed in the district and appellate courts, he didn’t have the same luck with the apex court. The history of the Kingdom of Mustang goes back to the sixth century when it was a small administrative unit within Tibet’s Dari province. After the 14th century, it officially became the Blo kingdom, established by the Amadpals, a small group of authorised people working as administrators in Dari. Manthang was declared the capital, which is where the present-day name ‘Mustang’ originated. The kingdom, however, was still not recognised as an independent state by its neighbours, and was made to operate under Gunthang, a neighbouring kingdom inside the Dari province. Because Mustang didn’t grow enough crops to be self-sustainable, it was therefore compelled to bend to the authority of other, more powerful forces. 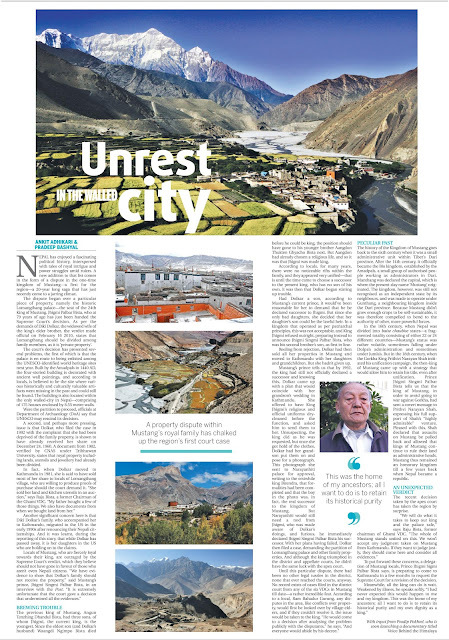 In the 16th century, when Nepal was divided into baise chaubise states—a fragmented totality consisting of either 22 or 24 different countries—Mustang’s status was rather volatile, sometimes falling under Dolpa’s administration and sometimes under Jumla’s. But in the 18th century, when the Gorkha King Prithivi Narayan Shah initiated his unification campaign, the then-king of Mustang came up with a strategy that would allow him to retain his title, even after unification. Prince Jhigmi Singmi Palbar Bista tells us that the king of Mustang, in order to avoid going to war against Gorkha, had sent a covert message to Prithvi Narayan Shah, expressing his full support of Shah’s “highly admirable” venture. Pleased with this, Shah declared that assaults on Mustang be pulled back and allowed that kings of Mustang continue to rule their land as administrative heads. Mustang thus remained an honorary kingdom till a few years back when Nepal became a republic.